The Arab world back in the 70s and 80s gave us quite a few very interesting rock and pop acts. Ahmed Fakroun from Libya was THE one of them. Here we have his 1983 album whose title means ‘Love Words’ in English. And in fact his kind of ethno pop seems to go deeper than just to the charts where a song like ‘Soleil! Soleil!’ – a typical yet outstanding synthie pop / new wave anthem that would have gone well with David Bowie or Duran Duran in the early 80s – definitely would have belonged. Other tunes are more Oriental with great string arrangements and those mystical melodies only Arab and Oriental music provides. It goes forth and back with these elements. ‘Mots d’amour’ is a rather colorful affair, when it comes to 80s pop music and within the fine arrangements you will find a lot of solid handcraft from the instrumental section. Whoever worked with Ahmed Fakroun in the studio during the album production shall be praised and blessed for his talent as well. All in all this is one of the lost gems of 80s pop music which fetches prices up to 500,00 Euros for a nearly mint copy today. So fans of cool 80s pop with a memorable edge are now able to grab a copy of this forgotten jewel. Compared to many European releases from that year, ‘Mots d’Amour’ can easily match up with all of them and has several outstanding evergreens on board. The sound is perfect for the time as well. So grab a copy of the reissue and make your dance party go crazy with this fascinating guy from Libya. 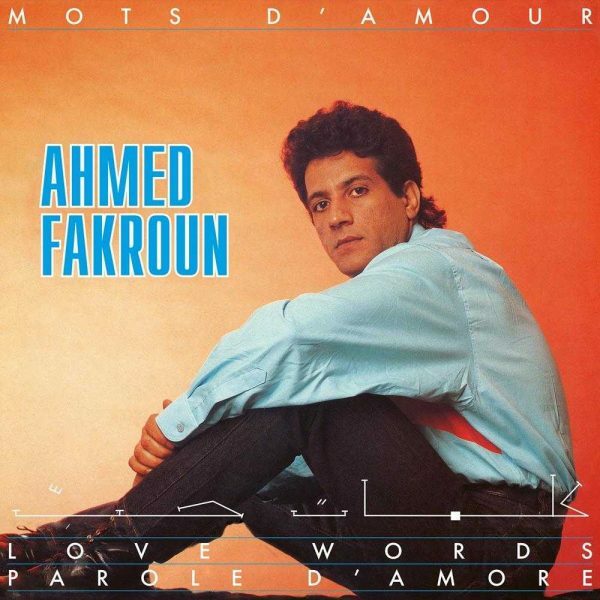 Watch out for more fantastic releases of Ahmed Fakroun, published and distributed by PMG!